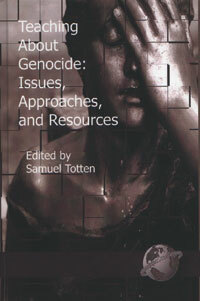 In Teaching About Genocide, education professor Samuel Totten has selected essays from noted scholars internationally to address a range of issues in genocide education. For example, an early essay outlines a broad historical overview, while later essays present specific case histories of major genocides and offer instructional strategies for teaching about genocide. Totten argues that only by getting at the “whys” behind the whats, wheres and hows will students even begin to gain a clear understanding of genocide.